Going in to space was always one of the biggest dreams people had, even thousands of years ago. Many science fiction authors had written about travelling in space even before the first airplane flight (in 1903). One of the most famous science fiction books is "From the Earth to the Moon" by Jules Verne -- it was written in 1865, more then one hundred years before the first person walked on the moon. Space begins about 100 km or 62 miles above the earth. In 1942, the German rocket A-4 became the first to reach that height, but it wasn't meant to do anything but fall straight down again and so wasn't terribly useful. The Soviets were the first to put anything in space that would stay up: they launched the Sputnik 1 satellite on October 7, 1957. This event started the Space Race, a competition between the United States and the Soviet Union. 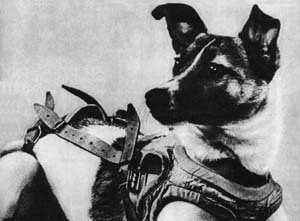 Within a month, the Soviets launched Sputnik 2, and in that spacecraft was the first space traveller: a dog called Laika. The americans were very surprised that the soviets could have launched Sputnik, and began to design rockets and satellites of their own. The two countries would compete for the next few decades -- this was called the Space Race. On April 12, 1961, the first person was sent into space: Yuri Gagarin, a soviet, riding in the spacecraft Vostok 1. The soviets would send more people into space over the next few decades, and so would the americans, but it wouldn't be until 2003 that another country would launch a spacecraft with people in it: China, with the Shenzhou 5. At the beginning of the 1960s, American president John Kennedy made a famous speech in which he said that the U.S. was going to send people to the moon within the next 10 years. And that's what happened: in 1969, Neil Armstrong became the first person to walk on the moon.